Using marijuana or marijuana butter to make fruity pebble rice krispie treats is very easy, tastes great and gets you very stoned. I prefer to use fruity pebbles to make my krispie squares as they taste much better and can help mask the weed flavor that potent butter recipes have. 6 cups of Fruity Pebbles Cereal. (I prefer fruity pebbles over rice krispie due to its ability to mask the weed flavor). 1 pkg of regular marshmallows (10oz). Add cereal and stir until evenly coated. 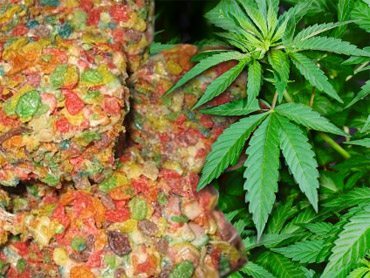 ENJOY Your Funky Fruity Pebbles Weed Treats! after making these according to recipe i would change it as follows. cut the fruity pebbles with rice crispies 50/50. otherwise it comes out…extra fruity pebbly which i didnt really like. cannibutter, i used about 5 tablespoons and ate 2.5 treats. recipe called for 3 tblspns. nothing. i couldnt eat anymore because it was…well you try to eat more than that. an old reply stated 11 worked great. take that as you will and land in the middle somewhere. – Text Only for prices and imprints . thank you for the recipe it was my birthday yesterday and i used 11 tablespoons of cana butter from saddleback collective in santa ana got me way stoney and i only ate a cuple bites any sugestion on the serving size?